Glamourous, don’t you think? However, digital signage hasn’t always been this flamboyant. The earliest digital signage technologies can actually be traced back prior to 1970. It’s true! Predominantly found in electronics stores, they consisted of colossal sized TVs fitted with those ‘bunny ear’ aerials, often playing an old video tape featuring an advert. However, many industry commentators identify the automated teller machine (ATM) as the ‘birth’ of digital signage, leading to the revolution that we see today. ATMs flourished towards the end of the 1970s & the early 1980s, highlighting how crucial digital signage can be for instigating transformation. ATMs revolutionised the banking world, for those that implemented them. Those that didn’t catch on early felt the impact as they fell behind their competitors. The rise of the internet, towards the end of the 1990s, proved to be the next defining moment for digital signage. Word spread of improved digital displays, the emergence of highly sophisticated software and better digital information technologies, all contributing to the rising number of industry sectors utilising digital signage systems as viable communication tools. Fast forward to 2015 and digital signage has infiltrated virtually every industry sector including: retail, hospitality, entertainment, public & private sectors, education and transportation, to name a few. 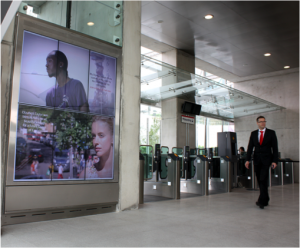 Digital signage now has stature, with systems continuously evolving. 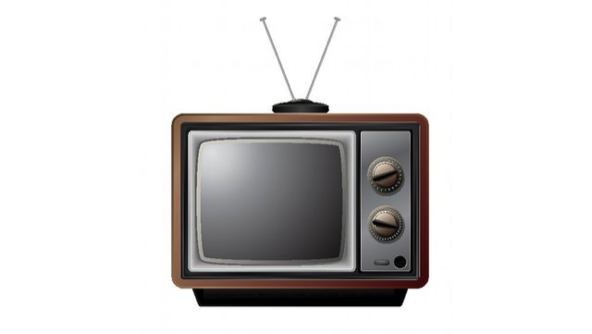 What began as a colossal TV playing a video advert, soon became commercial advertisements played via mounted HD TVs. However, as digital signage advertising evolved, so did audiences. No longer were they content with a HD TV simply displaying a reel of adverts. So, interactive touch screen digital signage entered the scene. Much of today’s digital signage encourages audiences to actively engage with it and this has delivered noticeable results. Introducing an interactive element is proven to result in a higher return on investment (ROI). Not only that, interactive signage has enhanced ‘word-of-mouth’, with audiences taking to social media to spread the word. It’s not uncommon to hear of digital signage units featuring playable games or interactive quizzes that could lead to prizes. All these features are designed to increase dwelling time and influence audiences, enhancing the effectiveness of digital signage. What was once labelled a luxury, a novelty and a fad has actually excelled, emerging as a highly effective communications tool. Digital signage continues to grow in strength because it changes to make use of technological advancements. Much like the wheel transformed transportation, digital is transforming communication. Our phones are digital, TV has gone digital, so the next logical progression for advertising is digital. 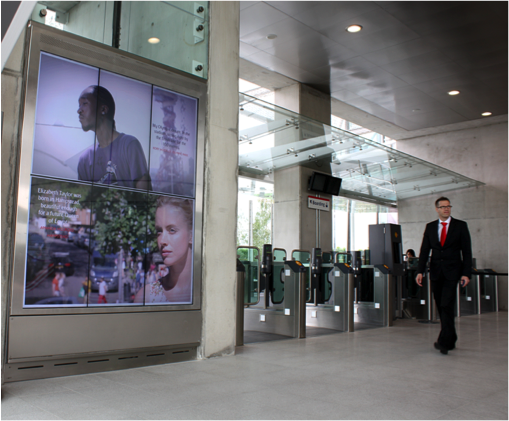 If a business is to ‘keep-in-touch’ with its audience, it has to embrace digital signage. Yes, it’s hard to let go of methods you’re comfortable with such as print advertising. However, businesses have evolved before and thrived. We can liken the emergence of digital signage to that of email. Email was once considered a concept that would never catch on as businesses were strong ambassadors of the postal system. However, email revolutionised communication, speeding it up and reducing reliance on ‘traditional’ mail and even fax machines. As a long-term solution for advertising, digital signage is leading the way. Year after year more digital signage displays are emerging. By the end of this year alone , Intel predicts that there will be 22 million digital displays, powered by 10 million media players, in use worldwide. Digital signage has become popular because it does more. A great way to gauge its popularity is to research just how much marketers are willing to spend on getting their message on a digital sign. Why? It reaches further, quicker & arguably, for less money. However, arguably the biggest factor that defines the rise of digital signage is availability. It’s available to all, whether you’re an SME or global corporation. The installation of a digital signage system could ultimately be your catalyst for growth. Dynamax has been in the digital signage industry for nearly 20 years and in this time has continually adapted to the changes. Its POVng software is used by major Blue chip clients to enhance customer experience in retail, corporate , education and transport across the world. With the launch of digitalsignage.NET 3 years ago, Dynamax made access to digital signage much simpler allowing not only use by larger organisations, but anyone in any sector wishing to be able to provide a visual experience that can inform and entertain a target audience . It’s simple cloud based software requires no technical expertise and can be used by anyone with an internet connection and a web browser. To find out more go to http://www.digitalsignage.net and check it out for free yourself. Daniel Waldron is a copywriter for Armagard, specialists in the manufacture of enclosures for AV equipment. Armagard were the 2013 winners of the prestigious UK Queen’s Award and National Chamber of Commerce Award. Visit the website – www.armagard.com – Follow Armagard on Twitter @Armagard. This entry was posted in News and tagged digital signage, digital signage advertising, digital signage software, retail digital signage by Dynamax. Bookmark the permalink.